Anyone who snoozed through physics lessons at school could scarcely have imagined the chaos that might ensue when BBC Breakfast tackled the subject this morning. It began so promisingly, when Top Gear's Richard Hammond said he'd be delighted to appear on the show. But, perhaps Bill Turnbull and Sian Williams should have been warned when the producers laid on a supply of children's balloons, metal skewers and plastic bottles. The challenge was: insert the skewer into the balloon, without it bursting. And, blow up another balloon inside the plastic bottle. The correct solution to both problems would demonstrate the practical application of the principles of physics. But, three burst balloons later, Sian began to worry that a midwife might be needed rather sooner than expected. Then, Bill tackled the balloon in the bottle challenge with such gusto that he gave himself a nose-bleed, just before the end of the programme. 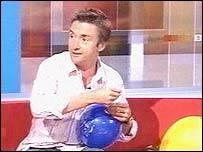 Richard Hammond, a man who claims to be able to walk on custard (yes, really) explained that the skewer in the balloon trick will work - with a lot of patience and a little Vaseline. The trick is to cover the end of the skewer with Vaseline, then, very gently twist it into the top of the balloon, where the molecular structure is densest. If done with enough care, you can actually get the skewer into the balloon, without causing a tear. The balloon in the bottle trick requires a hole at the end of the bottle, to let some of the surrounding air out as you inflate the balloon. Perhaps it was the build of pressure which led to Bill's nosebleed. A physicist would undoubtedly know.